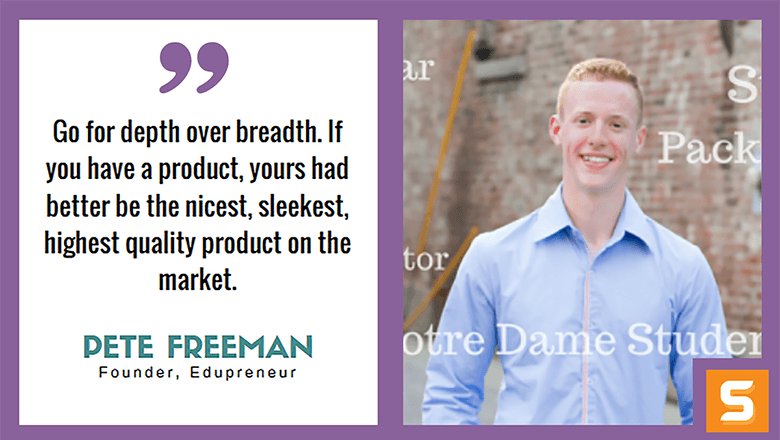 Pete Freeman is an innovator, student, scholar and co-Founder at Edupreneur. He speaks and share his experiences in business and innovation with people around Indiana. He also has a passion for scholarship, and a proud student attending the University of Notre Dame on a full-ride Lilly Scholarship. In this interview with Startup Savant, Pete shares his experience how he began his entrepreneurial career at a very young age, and how he evolves into a young entrepreneur juggling school and business. After getting to know Pete and how he juggles school, life and career, make sure to follow him on Twitter! What motivated you to start Edupreneur? Did you see a way to serve customers better than your competitors? The most promising solutions to a complex issue, such as education reform, are most effectively created and implemented by bringing great minds together. The Edupreneur podcast brings great minds to bear on some of the toughest questions facing educators, policymakers, and parents. Our competitive advantage is that Zack, my co-host, and I are students. We both recently graduated from high school. Our perspective is unique compared to the thousands of adults who are making noise around education reform because we are on the receiving end. How have your motivations changed since you first started Edupreneur? Is there an area that you have grown most? At first, The Edupreneur was a platform for my co-host and me to discuss our own suggestions for educational change with each other. After the first 15 episodes, we became motivated to interview adult guests, engage them in our discussions, and plumb their perspectives regarding our questions and ideas. What do you consider the biggest milestone that you have hit with your business? How did you get there? Moving past a listenership that consisted of two moms, my co-host’s and my own, was pretty big :). Since, we were proud in late 2015 to release our first episode that received several thousand downloads. Who has been your greatest influencer along your entrepreneurial journey? How did they shape Edupreneur? The greatest influence of mine has been Gary Vaynerchuk, an entrepreneur, investor, and author. Gary taught me everything I know about social media marketing. His books and videos motivated me to work far harder than I had before crossing Gary’s path. I owe him much of my personal and professional success. What’s your most unforgettable experience as an entrepreneur? I am the co-founder of a nonprofit - Sparrow Program. Sparrow began during my freshman year of high school and ended in my freshman year of college. The purpose of Sparrow was to provide behavioral intervention for struggling elementary school students. When Sparrow had ‘closed its doors,’ our staff had served over 800 students over five years. That is an experience I will always carry with me. I struggle with perfectionism. I am tempted to do everything 100% flawlessly. In the process, I can be wildly inefficient. In the end, I’ve learned that you’ve got to crack a few eggs to make an omelet. I’ve learned to let the little things slide to accomplish the big things. I’ve learned to dedicate four hours to a V.I.T. (very important task) instead of booking eight 30-minute meetings to fill those four hours. Ultimately, perfectionism is an asset. But, it becomes a liability when it causes me to perfect so many little things that, at the end of the day, only move my business toward the goal line by a few centimeters. Are you using any Apps that help you stay on track every day? Those of you reading this right now - download Calm and Headspace. These are two meditation apps that are available on the app stores. These two apps have made me personally more calm, professionally more effective, and wholistically more awake to the joys of business and life. I’ve yet to find anything that competes with these two. I think of opportunities differently. When I take my girlfriend out on the town for a date, I make sure to act on even the smallest chance to do something fun or unexpected - climb a building to sit on top of the roof and watch the sun set, meet and engage the employees behind the ice cream counter, start an impromptu dance party on the town square. Opportunities are everywhere! If you want them, perceive them. Looking back, what’s one thing you would do differently with Edupreneur? Why would you change it? Looking back, I would end each day by pitching 15 potential guest edupreneurs via Twitter. By now, my co-host and I would have pitched thousands of guests, and who knows who else we may have interviewed by now! Life is a marathon, not a sprint. Slow and steady wins the race. What advice would you give to our readers who want to start a business in Indiana? Where should they start? Do not start a business by yourself. Get yourself a co-founder. Your business idea must be niche. Don’t go for ‘all of the customers,’ go for a small slice of available customers who are interested in something unique. Go for depth over breadth. If you have a product, yours had better be the nicest, sleekest, highest quality product on the market. Then you can deservedly price above your competitors. If it can’t be the highest quality, it must be markedly different. Hoosiers are warm people. Talk to your customers and clients about themselves, their lives, and their business using your product. Make friends, not clients. And once you’ve made friends, keep your friends coming back instead of chasing new ones. Be a farmer, not a hunter.